Herbaceous perennial, up to 150 cm. tall. Leaves 45 - 50 by 35 - 40 cm, base deeply cordate, margin ± undulate; nerves 8-10 pairs, very stout; lobes 15 - 20 cm, rounded, sinus open; leaf stalk succulent 50 - 90 cm long. Peduncle very stout. Spathe 12 - 15 cm long, coriaceous ; tube c 6.5 cm long, glaucous, limb erect. Spadix yellow, female inflorescence c. 3.5 cm, conical, sterile inflorescence c. 2.5 cm long, slender; male stout, cylindric, terminating in a rudimentary conical appendage. Ovaries numerous, narrow, stigma very broad, covering the whole ovary; ovules parietal, scattered. The ovaries are quite unlike those of its congeners. The plants grow well in marshy or wet soil under full sun. They are occasionally grown by the villagers for their edible leaf stalk. This plant similar in appearance with wild taro. 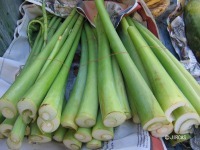 Distinguishing characters are yellowish green leaves and stalks. Leaf stalk can be eaten raw with hot and spicy papaya salad or as side dish together with other hot and spicy food. 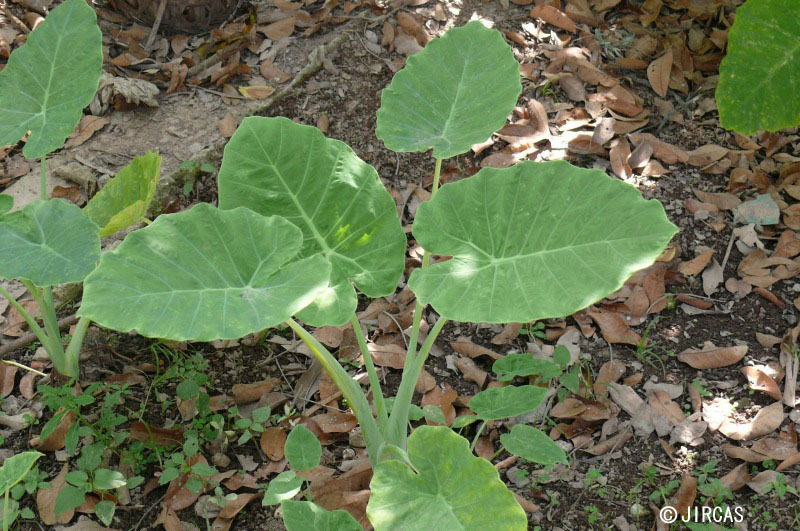 It is considered as the cultivated, non toxic form of wild taro. They are available year round. They can be easily grown from suckers separated from the old stem base. Caution : Colocasia gigantea is a selected cultivar found only in cultivation. There are many wild araceous plant similar to this species but with numerous calcium oxalate crystals in all parts. They must be cooked the same way as wild taro before eating.